Three masked gunmen stormed the office of a French satirical newspaper and murdered 12 within, apparently in "retribution" for running cartoons about the Prophet Mohammed. 2. Venus semisextile Neptune and co-ruled by Saturn which is square Neptune. The Pallas-Pluto novile, as the enabler of aggression, is a relatively weak aspect. Were this a stronger aspect like a conjunction, we would have seen much more violence this day. 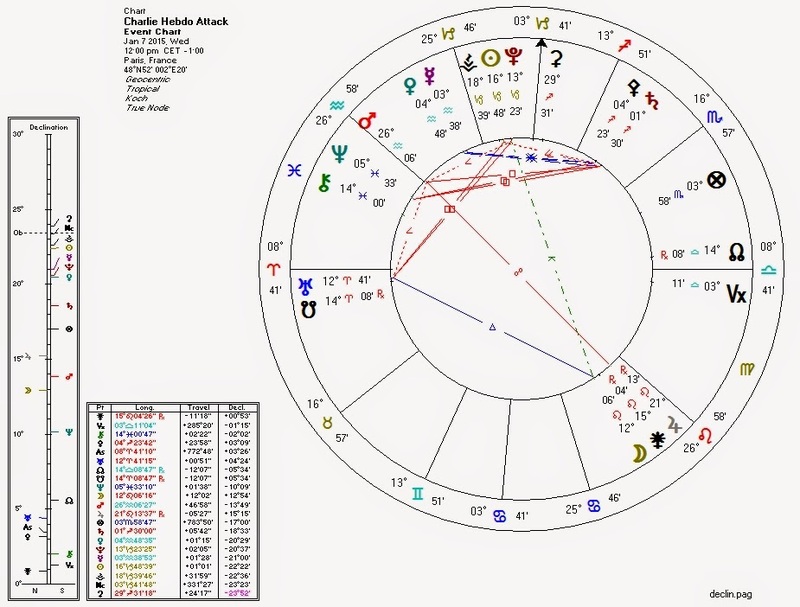 Some "bonus" aspects: Saturn square Neptune (struggle with foreigners) and Jupiter in Leo opposite Mars in Aquarius (identity politics connected to public action). Jupiter has its dark side, folks. My (limited) understanding of social class organization in France is that Parisian Muslims are much like Blacks in America: incentivized to stay out of the workforce by a gigantic welfare system purporting to "help" them, and violently pissed-off at perceived slights and inequality (much of which is related to welfare-dependance and its effects). In contrast, Muslims in America and Blacks in Paris seem relatively well-integrated into their respective mainstream cultures. Minorities not targeted by State "help" (such as the one to which I belong) tend to find their way in to peaceful, productive society.